The Keysight N5230A is available to buy refurbished used or rent, usually from our UK stock. Click here to download the Keysight N5230A datasheet. The Agilent N5230A is a member of the PNA-L series of Agilent network analyzers, offering design and manufacturing engineers the highest-performance mid-range VNA. PNA-L is the worlds best value for microwave manufacturing with accurate S-parameters at a budget-friendly cost along with future-proof capabilities. The PNA-L family is designed for passive components and simple active device measurements of amplifier and frequency converters. The Agilent PNA is used to test a wide variety of passive and active devices such as filters, duplexers, amplifiers and frequency converters. The high-performance characteristics of the PNA make it an ideal solution for these types of component characterizations as well as millimeter-wave, signal integrity and materials measurements. The PNA Series provides a winning combination of excellent hardware and powerful measurement applications to measure a broad range of devices fast and accurately. All models are available in 2-port single-source and 4-port dualsource versions. Pulsed S-parameters are easy using built-in pulse modulators and pulse generators. 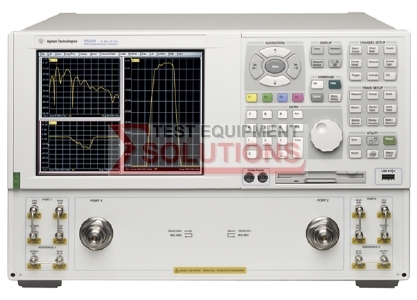 We offer the refurbished used Keysight (Agilent) N5230A .01-40GHz Vector Network Analyser for sale and rental. The Keysight N5230A is fully tested and refurbished in our in-house ISO9001 calibration laboratory. We supply manuals, accessories, full warranty and a free-of-charge Certificate of Conformity. We can also provide the Keysight N5230A with a fresh calibration for a small additional charge. If you have under-utilised test equipment talk to us about trading-in or part-exchanging it towards the Keysight N5230A or other refurbished test equipment.